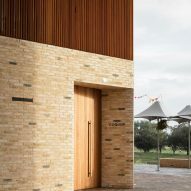 CHROFI and McGregor Coxall have completed a gateway building to frame a new public space and reconnect the town of Maitland, Australia, with the adjacent riverbank. 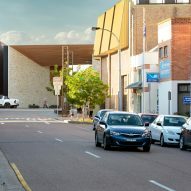 Sydney-based studios CHROFI and McGregor Coxall worked with Maitland City Council to oversee the public project, which aims to support the revitalisation of the town's central business precinct. 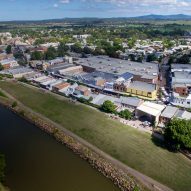 The Maitland Riverlink is designed to foster a positive relationship with the Hunter River for the town, following a series of devastating floods that had led to local residents perceiving the river as a threat rather than a resource. 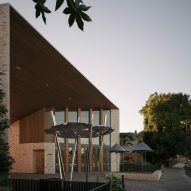 It contains public amenities for locals and visitors and is a new portal connecting the town centre with the riverbank. 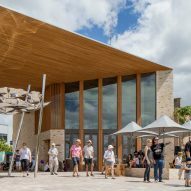 "The building is expressed as a 'sculptural gateway' that frames views to and from the Hunter River and attracts people to pass through the space," said the architecture studio. 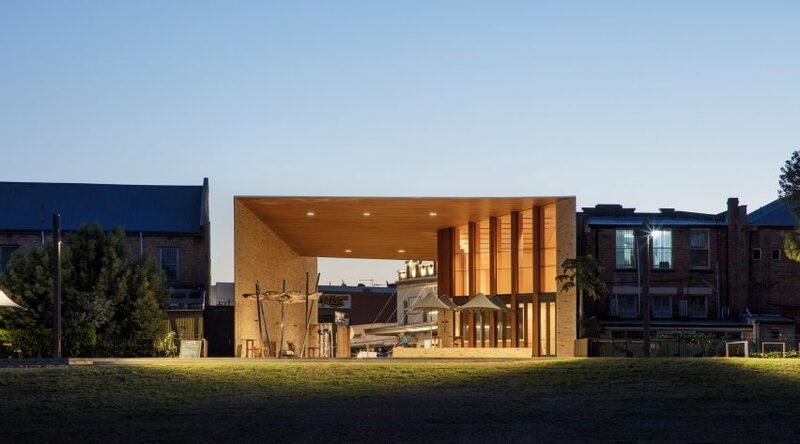 "The timber and brick arch frames a covered space for the community use, reactivating an underused part of town." The building occupies a disused site which was purchased and redeveloped to create a prominent new landmark that is visible from both the river and the high street. 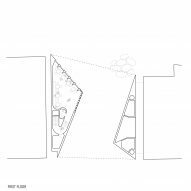 A series of angular surfaces envelop what the project team described as "a public living room" – an open-air public space accommodating a mobile library that can also be used as an outdoor cinema or theatre for special events. 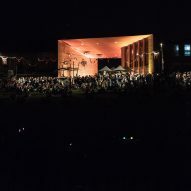 The brick walls on either side of the paved plaza contain a cafe and restaurant spread across two floors on one side, with publicly accessible toilets on the other. The use of clay brick for the walls are intended to echo the town's existing brick and sandstone buildings. The warmth and texture of the brick surfaces is complemented by the timber that wraps across the underside of the expansive roof. 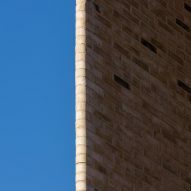 "Unique brick corners help the monolithic brick walls bend at unlikely angles," the added the architecture studios, "giving the material a razor-sharp, abstract quality." 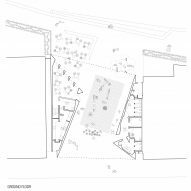 CHROFI and McGregor Coxall previously teamed up to present a proposal for a bushland cemetery without headstones, where the bereaved would use GPS to locate their loved ones' graves. 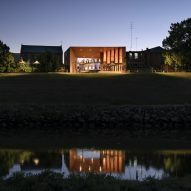 CHROFI has also worked on a pair of agricultural sheds featuring monolithic concrete portal frames set within a sustainably managed forest, while McGregor Coxall is working on a proposal to transform a landfill site in China into a wetland sanctuary for migrating birds. Photography is by Simon Wood.